20/21: Huge Parking Area for Trailers, Rafts, Kayaks, etc. If you're looking for the perfect vacation or family get-away, look no further! 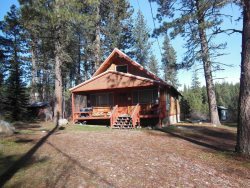 Situated in the middle of the Scenic Wildlife Corridor and centrally located near Garden Valley, Kirkham Hot Springs, and the Stanley/Lowman areas of Idaho, this vacation cabin provides access to an incredible selection of outdoor activities! Whether your heart's desire is a trail ride on horseback, a whitewater rafting trip, riding ATVs, or hiking the miles of nearby trails, you can have it all during your stay here. Comfortably seated overlooking the south fork of the beautiful and scenic Payette river, this historic miner's cabin features two private bedrooms, a living room, dining room, and a large, full bath. It sleeps 6 adults comfortably on two queen beds and a full futon as well as a window seat perfectly fit for a teen or child to sleep on. Central air keeps the cabin cool in summer and the numerous windows make letting in the mountain air a refreshing alternative in the evenings. Indoor amenities also include WIFI for keeping in touch and internet access. This cabin is also pet friendly! Outside, you can enjoy a fire pit with log seating, expansive decks, both covered and open for comfort in any weather, and views that can't be beat! Situated near BLM land and with the Payette as a natural boundary, you'll have all the privacy you desire combined with access to an incredible variety of outdoor activities and nearby shopping for any necessities. Don't pass up this perfect opportunity to enjoy convenience along with the beautiful scenery and numerous outdoor activities that make wild Idaho the place to be in summer! Karen is wonderful to work with. Always emailed or returned calls. Because of the 20 minute drive to town, we may not rent again, but we may. Beautiful cabin. Cons--about 20 minutes from Garden Valley Mkt and coffee shops which may be a plus for some. There are no bedside or chair side lamps(we brought our own)and most of the light bulbs were out in the first bdrm off the living area. Deck is south facing so unusable in summer after noon or so but we totally enjoyed our coffee in the morning looking at the river. Probably be great in spring and fall. Pros--The VIEW--AMAZING-we watched the rafters, deer and wild turkeys! No neighbors, totally private. Excellent air for the hot south facing kitchen and great working WIFI. The kitchen was well stocked. No dishwasher which was Ok for us. Cabin is all on one level--a real plus. Only one bath but it is huge with plenty of towels. Overall, we loved the cabin. It would be hard to find a better view. If privacy and view are what you are looking for, look no more--this is it. I only worked with Karen and she was awesome! Very helpful and very warm person. I can't wait to come back again! We absolutely LOVED our time there, and were sad we only stayed for two nights. The cabin was very easy to find, but very secluded. The cabin and property exceeded our expectations, thank you, Karen for sharing your wonderful property with us! Karen displayed excellent professionalism in handling our reservation. She was quick to respond to any questions we had, and was easy to work with. Thanks! Karen was AWESOME! She was a pleasure to work with! Karen provided on-time feedback, was full of great and honest information. If we ever bought property in Garden Valley-we would have Karen manage the property! Very trustworthy! It was so much fun! My two little twins girls loved playing on the deck and playing baseball out front. One of my littles ran into the kitchen to tell us she saw an ostrich..which turned out to be a wild turkey! SO COOL!! We also saw five cow elk Friday evening. The sound of the river was incredible not to mention to view from every back window and deck. I would recommend this cabin to anyone who wants to be one with nature. The cabin was so cute as well! thanks for the relaxing time!!! The only bad was the weather, and that is under no ones control We had a great time and talked about returning again. Karen Smith was a godsend!!! After I arrived at another property(not yours),which was not ready and a nightmare. She contacted the property to find out when we could get in, (we couldn't), and proceeded to get us in at your cabin. She personally took me there, made sure I was checked safely and checked in on me during the entire stay. She was fabulous! Karen saved our trip. Where do I begin? There's the detailed mountains in the woodwork of the bedroom. Oh, or the window seat overlooking the river. How about the huge deck with the covered picnic area. Or the massive deck overlooking the river, great for star gazing. The intimate fire pit just step outside of the bedroom, so romantic. Kare was responsive and available. It was exceptionally easy to book and the Chevron folks were friendly.